Hi. It’s been chilly in the morning and evening in Shanghai and I feel autumn is on its way. The temperature of Shanghai is just the same as that of Tokyo. October 1st is the Anniversary of the Founding of the People's Republic of China. The tourist spots in the Shanghai area are full of people for the holiday week. Knowing that I shouldn’t be in the crowds, I visited the popular sightseeing resorts, such as Yu Garden and The Bund. The Bund was once governed by foreign countries, including the U.K. It refers to the Western buildings and wharves of the former Shanghai International Settlement. The night illumination is superb. I was planning to cross the river where the Oriental Pearl Tower (468-meters high), the symbol of Shanghai, stands, passing through the illuminated tunnel. Unfortunately I was unable to buy a ticket at the site because of security purposes. I needed to book in advance. It gave me a chance to visit again someday while I stay in the city. 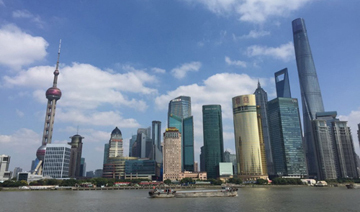 On the opposite bank, where the Oriental Pearl Tower and the highly modern sky scrapers of office buildings are currently developed, the area is called Pudong. It is the center of the financial and business district. 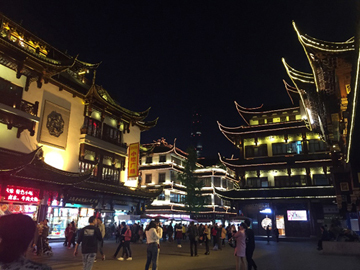 ▲The view of Yu garden at night is fantastic as well. Well, the Chinese cuisine is called one of the three major dishes of the world. What do you like the most? Shanghai dishes are full of seafood with seasonal ingredients, and rich and strong sweet-and-sour seasoning is its feature. 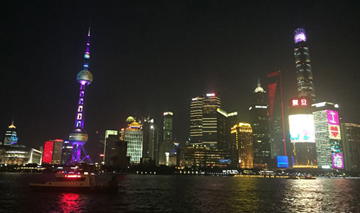 The word “Shanghai” may first remind you of a “mitten crab,” but I’ve not experienced it. 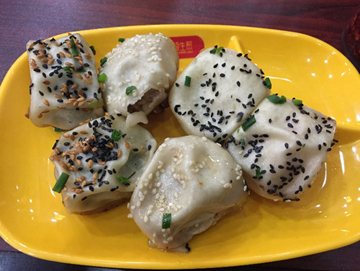 As a snack, I recommend a “Shengjian”, a fried bun. It’s an ingredients-wrapped bun with a thick shell grilled on an iron plate. 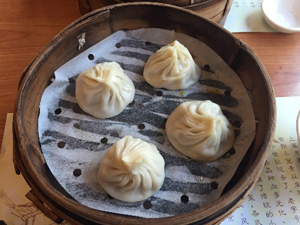 It’s a little bulkier than a xiaolongbao, with a flavorful crispy shell and tasty bouillon inside. You’ll become its captive once you eat one. It is difficult to say which of the two is better. 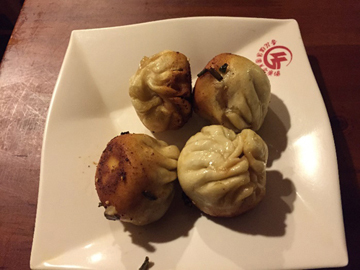 ▲Shengjian (fried bun) comes in three kinds of ingredients: pork, vegetables, and shrimp. 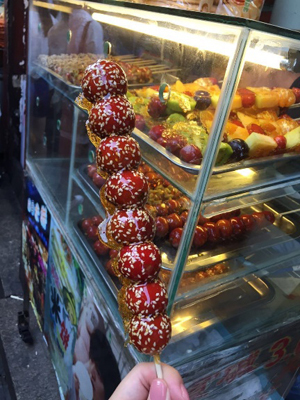 We commonly see candied strawberries and candied apples at food stands at local fairs in Japan, while I often see candied hawthorn at vendors here. I tasted one sprinkled with sesame seeds and I liked the tart-sweet flavor and its apple-like texture. Hawthorn is originated in China and used as a stomach medicine, a dried fruit, and for cooking as well. 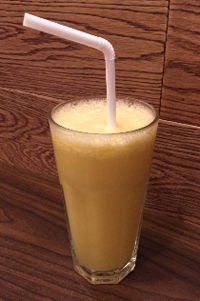 The “Apple and Pear juice” I tried at a café was good too. They make it fresh in a blender each time after an order. I would rather have it for breakfast since the apple and pear fruit bits are left and the thick taste is easily kept in the stomach. Right after my order I noticed there was a “Cucumber and Pear” too. I was a little surprised, but cucumber juice is sometimes seen in Shanghai. Later I found an “apple, cucumber and lemon juice” and tried one to make up for insufficient vegetables since I’ve moved here. 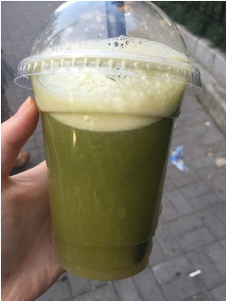 It was a vegetable juice, mostly cucumber with some apple flavor. 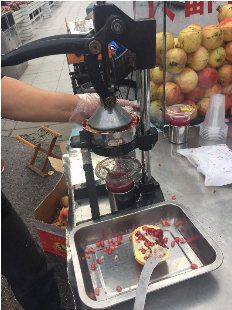 There was a crowd of people around the vendor who sells fresh Pomegranate juice on the street. I again tried one. In my childhood my grandfather used to have a pomegranate tree and we often enjoyed the fruit in fall. I missed the taste so much and I couldn’t wait to have the good old flavor. In spite of my memory of the Pomegranate’s tartness, I tasted nothing but a light flavor, later I felt bitterness on my tongue. (Probably it came from the seeds.) I heard that the pomegranate originated in Persia and (Iran) was called “The Apple of Carthage.” The trees grown in Japan were mainly for garden plants and their fruit was sour. It is said that cooling your body is not good for your health, so there is no ice in cold drinks. You find many drink shops in every corner of the city, but you are to ask for some ice when ordering. I see a large number of Chinese people drinking without ice cubes. I find so many good foods in China. You never mind your weight. Wait a second, do I look like Winnie the Pooh?